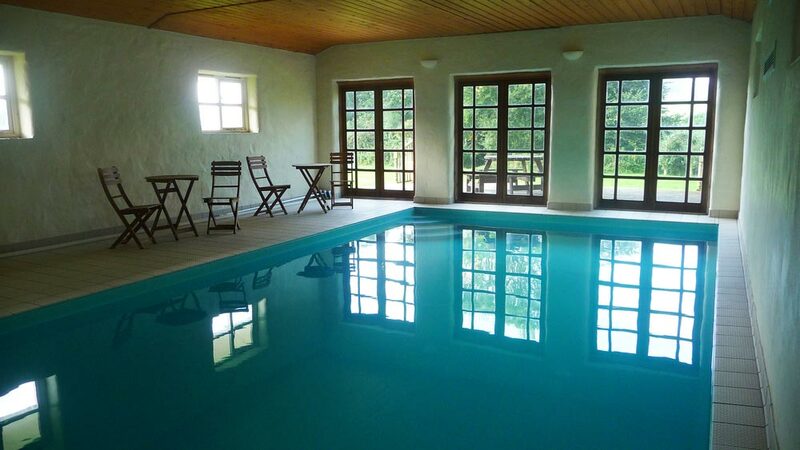 Set amongst twenty acres of our own land with many quiet spots to just sit and be, the center offers you an heated indoor swimming, a meditation / group room, a selection of lovely walks spanning out from our land and the beach is a five minute drive. The group room is spacious (8.5m x 6.5m) with an enclosing light filled feel, created by building with straw. Many people comment on the quality of the atmosphere, added to every time we meditate, and work deeply in the room. There are a number of different chairs, cushions and sheepskins for your comfort, with a wool carpet throughout. This room is available for you to use for stillness and reflection whenever you need, during your stay. The pool is warm (29oC). We have just installed a U-V light cleansing system, using light as a bactericide and therefore less need for chlorine, much better for the skin, earth and life! The cleanliness/PH levels are checked daily. The decking outside lends itself to Yoga, Tai Chi or just a quiet moment looking across the valley. We have found the swimming pool a wonderful addition to the sitting and energy work, to have a swim when you have been sitting most of the day is a real joy.